Braeburn is one of the most important commercial apple varieties, grown in all the major warm-climate apple producing areas of the world. It has a very good flavour when grown in the right conditions, and stores extremely well. There are numerous different sports or clones of Braeburn - these arise as natural mutations and are favoured by commercial growers because they usually more highly coloured in areas with less sunshine such as the UK. The best-known in the UK are 'Mariri Red', 'Helena' and 'Hillwell' (which we supply). The latter two are considered early ripening - although that still means late October or early November in UK conditions. Please fill in the details below and we will let you know when Braeburn apple trees are back in stock. Crisp and slightly lighter texture than Braeburn, but a similar sweet/sharp flavour. Similar texture to Braeburn, with a slightly sweeter flavour. 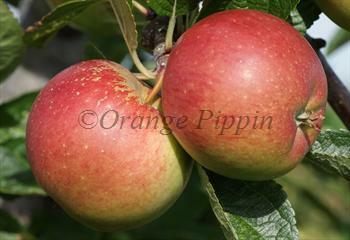 Although un-related to Braeburn, Chivers Delight is a hard crisp apple with a similar good aromatic flavour. late October / early November? A borderline case - only needs about 700 hours? Cold hardiness: -10F / -23C? 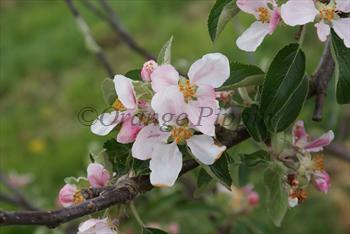 Braeburn is in flowering group 4. Braeburn is self-fertile and does not need a pollination partner, although fruiting may be improved if there is a compatible tree of a different variety nearby. Braeburn is generally an easy variety to grow, but it needs a long growing season. It is particularly well-suited to the intense sunlight of the southern hemisphere. It should be successful in the southern UK, and does very well in France and Italy. The tree will grow quite happily further north, but the apples may not ripen in a shorter growing season. It is self-fertile and does not necessarily need a pollination partner to produce apples, and is a good pollinator for other varieties that flower at the same time. Braeburn was discovered in New Zealand in the 1950s, and is possibly a seedling of Lady Hamilton. It is popularly thought to be related to Granny Smith, but the relationship - if any - has never been proven.